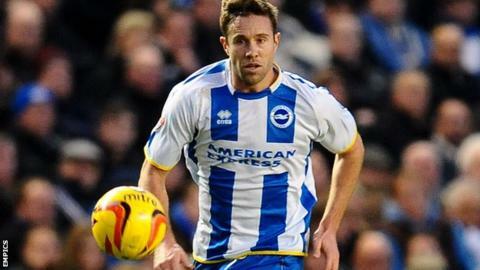 Brighton defender Matthew Upson says they must not be too disheartened after failing to beat struggling Blackpool at home on Easter Monday. The 1-1 draw means the Seagulls will slip out of the play-off places if Reading beat Middlesbrough on Tuesday. "We have got to be careful we don't get too disappointed as we are still in a great position and it is all to play for," Upson told BBC Sussex. "We are far from out of it and we are still in a great position." Brighton have failed to pick up maximum points at home to several bottom-half sides in the Championship this season, with Blackpool the latest instance. Millwall and Huddersfield left Sussex with a point each while Barnsley took all three points from their visit south in September. However, Albion did beat Charlton in recent weeks and entertain bottom club Yeovil on Friday evening. "In those games this season we maybe haven't maximised the points as much as we would have liked to have done," 35-year-old centre-back Upson added. "Blackpool was no different. It's a difficult question to answer as there is not a lot different other than the team we are playing. "Maybe it's a slight psychological thing. "We get a little bit desperate at times and want to get the ball forward and in the box and have something drop for us. "But that is not really the way we play and maybe something we need to review and be more patient." Upson missed the trip to Huddersfield on Good Friday, which was just the second time he was not in Brighton's starting XI in the league this season. The former England international has revealed he is carrying an ankle injury which will have to be managed until the end of the campaign. "It is something I don't think will ease off too much at this stage of the season," he said. "It's a small tear in a tendon at the side of my ankle and I think it needs rest to get better. "It is just painful but I will take some tablets. I'm trying to get through and end the season well. "I have trained as much as I can. At this stage of the season training is not as important as it is in your mind and your legs."